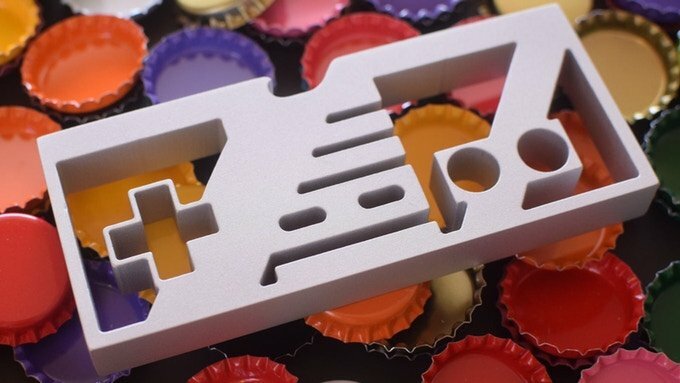 If you happen to enjoy your gaming with the odd beverage or two, this NES controller-shaped bottle opener might come in particularly handy - and it just so happens to be one of the coolest takes on a generic household item we've seen, too. 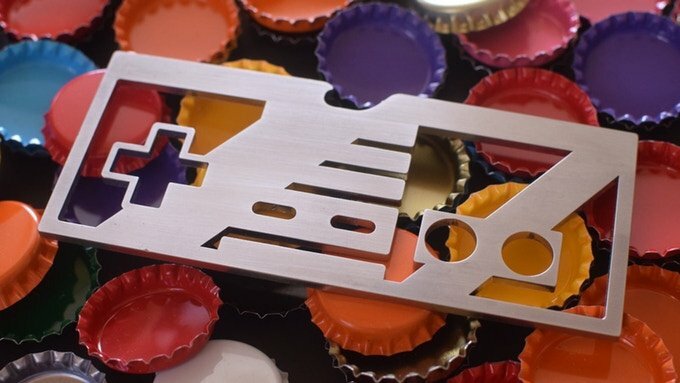 Part of a Kickstarter crowdfunding campaign which has gone live today, the bottle opener is actually offered in two variants: standard and slim. Both of these are of the same height and width as Nintendo's very own controller, with all of the buttons exactly where you'd expect to find them. As the Kickstarter page states, "your fingers will fall naturally into place on the buttons and direction pad, ready to punch a few blocks, leap onto a mushroom, or enter your favourite cheat code". You can see close-ups of both variants side by side below. Each comes with an "Up Up Down Down Left Right Left Right B A - Start Drinking!" sticker, with the standard version being made of 1/2 inch aluminium and the slim being cut from stainless steel. Each one comes tucked away in its own little box, and delivery is expected by no later than May should the project be a success. At the time of writing, early bird backing options are still available, allowing you to get the slim and standard variants for $20 and $40 respectively. Feel free to check out the product's Kickstarter page to see the bottle opener in action and to snag your own. Would you like one of these for yourself? Do you collect gaming-influenced products for your home? Let us know if you'll be getting one of these in the comments. For $20 or $40 i would rather just invest in a good game. how does Samus Aran open her wine? with a Cork Screw Attack. but I only drink mountain dew. DO THE DEW, BROS. I was going to make a comment about how it can be used to open non-alcoholic beverages, but now that I see the sticker that says "start drinking", I'm just going to say that this is disgusting. Just back this. Dont know why I really dont drink. crazy prices for the product, plus I don't like the design even. I wonder if they had to add the distinction to the design to avoid possible copyright issues. 20$ for something they can pump out on a CNC machine? it cost them like 25 cents to make that thin one.....honestly theres nothing special about these and i feel bad for the idiots who pay for this. @ALinkttPresent So your claim is that it's "disgusting" that some people enjoy both playing video games and drinking alcohol? Wow. Well, for the record, I think it’s pretty awesome that you can pound the cold ones while playing Ridge Racer. 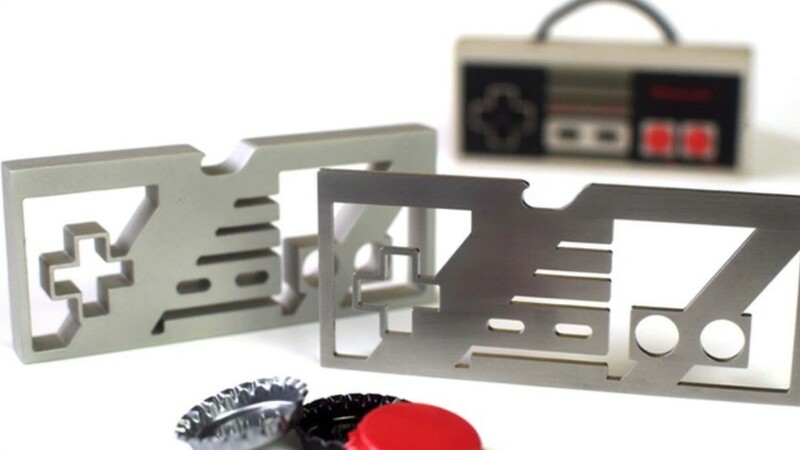 @NintoRich I actually use my NES Zapper bottle opener (from the Bartendo line) on a relatively regular basis. Love that one. @robr the geeks have inherited the earth, and you can be a geek when It comes to anything. I'm a geek for comedy, music, movies, games, and sports. We live in the greatest time truly. 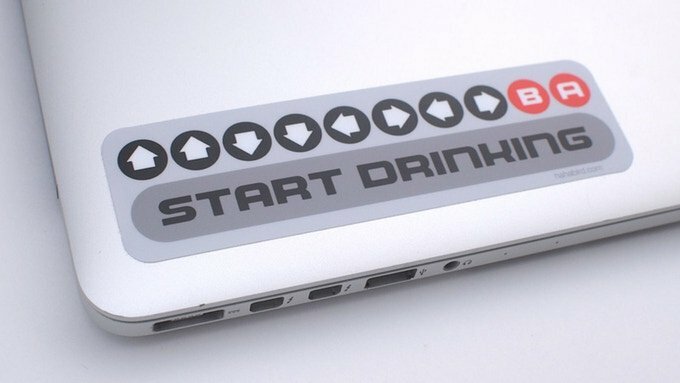 Who the hell would put a sticker of the konami code that says start drinking on a macbook? Show off? No, if I had this I would hide it when I wasn't alone. I also don't wear video game t-shirts. I grew out of those about the time I grew out of Iron Maiden t-shirts. @ALinkttPresent what do you mean exactly, friend? 😅 what’s disgusting? I think I'll just stick with the Coca-Cola bottle opener that I've got. @Kainbrightside I think that is how this crowd funding pitch started though. I would back this but I don't drink from glass bottle, I only drink cans. It looks too sharp-edged to me. And the aluminium one isn't shiny enough. We like shiny things. Sorry fellow dragons, I'm out. That looks kinda weird to use. You know, not everything you own needs to be videogame themed. @jedisquidward This. Carefully chosen merch and influences is great but when it's forced like this, it's a bit tacky.